A Melbourne man had the bright idea of using yeast extract to create a wonderful source of vitamin B and a tasty new spread named VEGEMITE. Vegemite dates back to 1922 when Fred Walker and Cyril Callister developed a spread from one of the richest known natural sources of the vitamin B group - Brewers Yeast. Walker turned to the Australian public to officially name his spread, but it was Walker's daughter who chose the winning name Vegemite and in 1923 Vegemite first graced grocers' shelves. It was described as "Delicious on sandwiches and toast, and improves the flavour of soups, stews and gravies". 22 million Vegemite jars are sold every year, with 'every jar made' in the Melbourne factory at Fisherman Bend since 1923. 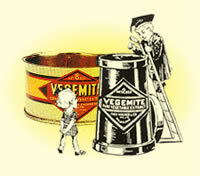 As we now move through the 21st Century, Vegemite remains relatively unchanged in recipe and label with over ! The The Happy Little Vegemites jingle was first performed on radio in 1954 when a trio of bright youngsters with a vital beat burst into song with the toe-tapping jingle. For many Aussies Vegemite is the original sandwich spread, but it may come as a surprise to find out that Marmite was first patented in 1902 making it the original sandwich spread. Vegemite is owned by the Australian Bega Cheese group (January 2017). See below for links to Vegemite and our favourite Send a Vegemite eCard..
→ www.kraftfoods.com - Vegemite does not get a mention? → Send a Vegemite eCard to your friends and family. → The unofficial Marmite website - no official site? → How do you like your Vegemite?